I've done the Merritt when 684 has been really backed up. It's been a number of years but I remember it being hit or miss. But, it's a nice, scenic drive. You should give my route a shot and see how it does. One thing I will warn you about - the exit off 684 to 84 can be hellish. You hit that the wrong time of day you'll wish you were never born. On a Sunday it shouldn't be too bad. Rush hour during the week? Bad. Very bad. psu_dad wrote: One thing you may want to try is taking the Mass pike to 84 to 684. You still have to cross the Tapenzee but you at least avoid that rough part of 95 coming down the coast. I may try that just for grins some day. Right now, I let my new GPS unit pick the route. It has a MUCH better traffic monitoring system than my old unit had. It also allows me to specify an intermediate waypoint in getting to my destination. So I can basically tell it "Take me to me son's house, but go through the Tapanzee Bridge". When I do that, it invariably puts me on the Merritt Parkway (CT-15) in Conn, which takes me all the way to 287. I like the Parkway. It's scenic (as highways go), pretty straight (which I like) and despite only having 2 lanes we usually make very good time on it. Obviously I95 and the GW bridge is the shorter route distance-wise, but I would only go that way at 3:00 AM. Maybe. dad, I'm looking for a new GPS unit (the old unit is now dedicated to the tractor....., really). You seem to like your current unit, could you enlighten us as to its make and model? I've had Garmin so far but am open for a good recommendation, which I'll completely ignore like everyone who asks my opinion on equipment only to go their own way, much to their future dismay. Mad, we are similar in driving patterns. I'd like to think I'm defensive in driving style. One thing the Mrs. does that bothers me is her habit of driving down the middle of a country road. Never on a highway but approaching the crest of a hill scares the living crap out of Carl when I'm sitting near the center line of the road should it have ever been in existence. Eyes closed or white knuckles.....yet she never has a close call or even a semi-close call other than the tree fallen across the road, the back road, at night that I suggested she avoid and keep to the main roads given potential issues and remoteness of it all. The cell phone call came, in the pouring rain after dark on a Jan. night. Only $2K damage, fortunately. Overall she is a very good driver with some "habits". She was glad to see Carl coming to the rescue that night. If you like your Garmin, I'd stick with them. I now have a Garmin nuvi 2589LMT. The LMT stands for "Lifetime Maps & Traffic". I have access to street map updates and their traffic monitoring service without extra fees. My old model was a Magellan. It had some issues. I had to pay for map updates and the traffic monitoring wasn't great. Eventually Magellan stopped supporting my model because of its age. It's probably unfair to compare an old GPS unit to a new one. I'm sure they've all gotten better over the years. But I'm much happier with the Garmin. If you have a smart phone, I'd skip the GPS. Google maps and Waze are more than sufficient for GPS and directions, and probably better as they are always updated and give real time traffic updates. Real men don't use smart phones. They don't post selfies and follow the Kardashians on twitter. They use flip phones. 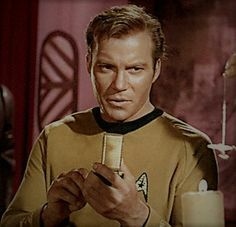 Captain Kirk was a luddite. People who were logical and embraced science used smart phones. And, technology has improved upon them and now they can fit in your pockets instead of needing to be carried on a pouch with a strap that looked like you were carrying a pocketbook. So you and B&W must be on top of this: Have the Kardashians posted any recent pics of their ginormous bums? And who is J.Lo dating? So you and B&W must be on top of this: Have the Kardashians posted any recent pics of their ginormous bums? Those are the only Cardasians I ever had any awareness of.